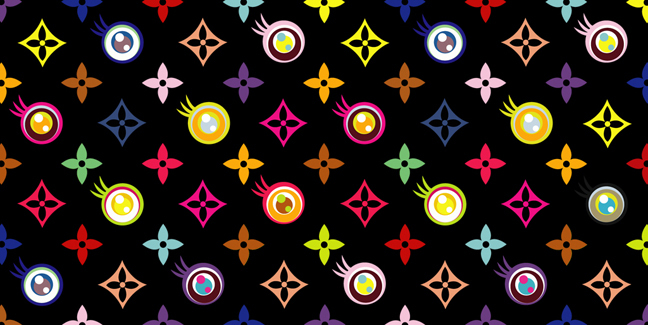 Takashi Murakami, Eye Love Superflat (Black), 2003. ©2003 Takashi Murakami / Kaikai Kiki Co., Ltd. All Rights Reserved. Takashi Murakami is an internationally prolific contemporary Japanese artist. He works in fine arts media, such as painting and sculpture, as well as what is conventionally considered commercial media (fashion, merchandise, and animation) and is known for blurring the line between high and low arts. He coined the term “superflat“, which describes both the aesthetic characteristics of the Japanese artistic tradition and the nature of post-war Japanese culture and society. Superflat is also used as a moniker to describe Murakami’s own artistic style and that of other Japanese artists he has influenced. Murakami is the founder and President of Kaikai Kiki Co., Ltd., through which he manages the careers of several younger artists and organizes the biannual art fair GEISAI. Takashi Murakami, Kaikai Kiki News, 2001. 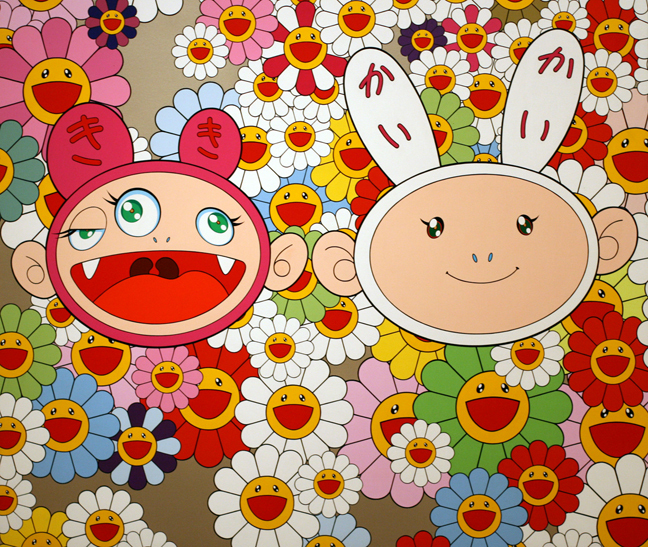 Image courtesy of Takashi Murakami, Kaikai Kiki Co., Ltd and Gagosian Gallery. All Rights Reserved. 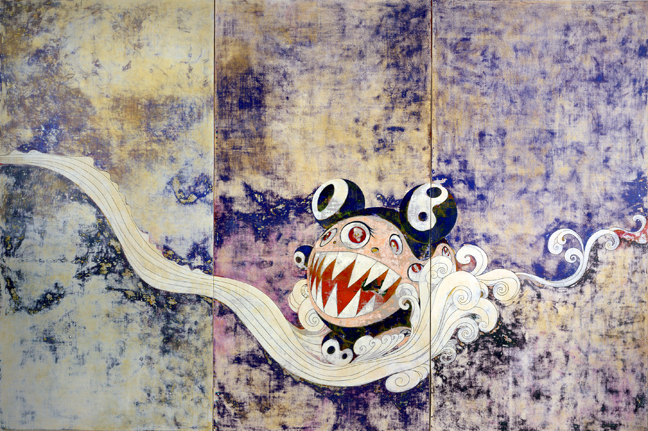 Born in 1962 in Tokyo, Takashi Murakami attended the Tokyo University of Fine Arts and Music and majored in Nihonga, the “traditional” style of Japanese painting that incorporates traditional Japanese artistic conventions, techniques and subjects. Though he would go on to earn a Ph.D. in Nihonga, he gradually became disillusioned with the field’s insular, highly political world. 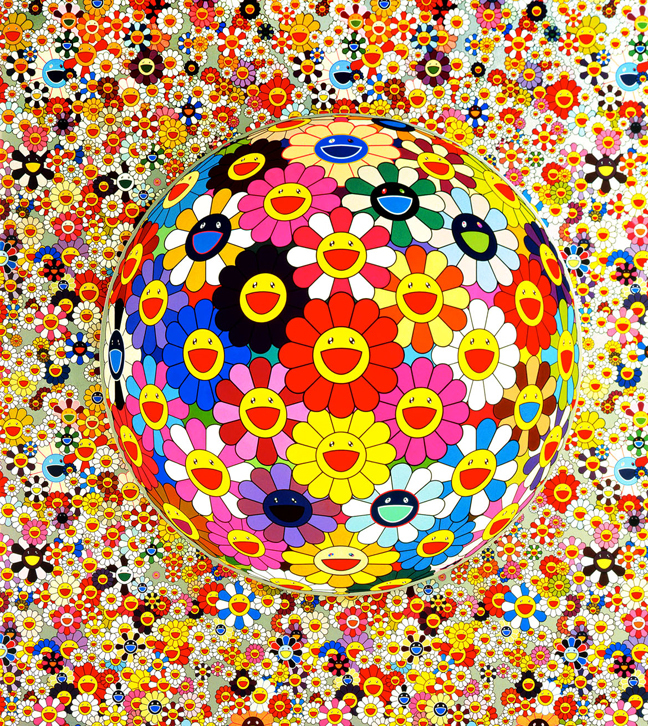 Takashi Murakami, Flower ball (3D), 2002. Acrylic on canvas mounted on board, Private collection. Image courtesy of Galerie Emmanuel Perrotin, Paris and Miami. ©2002 Takashi Murakami/Kaikai Kiki Co., Ltd. All Rights Reserved. Unsatisfied with the state of contemporary art in Japan, believing it to be “a deep appropriation of Western trends”, he started to explore more contemporary artistic styles, mediums, and strategies and became fixated on otaku culture which he felt was more representative of modern day Japanese life. Thus, much of his early work was done in the spirit of social criticism and satire. It is at this time that he began developing his own famous pop icon, “Mr. DOB”, which would later develop into a form of self-portraiture, the first of several endlessly morphing and recurring motifs seen throughout his work. Takashi Murakami, 727, 1996. Acrylic on canvas mounted on board. Image courtesy of Tomio Koyama Gallery, Tokyo/ Blum & Poe, Los Angeles. ©2000 Takashi Murakami/Kaikai Kiki Co., Ltd. All Rights Reserved. Murakami’s art encompasses a wide range of mediums and is generally described as superflat. His work has been noted for its use of color, incorporation of motifs from Japanese traditional and popular culture, flat/glossy surfaces, and content that could be described at once as “cute”, “psychedelic” or “satirical”. Among his most famous recurring motifs are smiling flowers, iconic characters, mushrooms, skulls, Buddhist iconography, and the sexual complexes of otaku culture. In addition to large paintings such as 727 (permanent collection Museum of Modern Art, New York) and Tan Tan Bo Puking – a.k.a. Gero Tan, he has also produced sculptures, balloons, “all-over” wallpaper installations, animated works, prints, posters, and assorted merchandise. In November, 2003, ArtNews reported Murakami’s work as being among the most desired in the world. Takashi Murakami, Flower Matango, 2001-2006. Fiberglass, iron, oil paint and acrylic. Image courtesy of Cedric Delsaux – The Hall of Mirrors / Château de Versailles. ©2001-2006 Takashi Murakami/Kaikai Kiki Co., Ltd. All Rights Reserved. From 2007 to 2009, Murakami’s first retrospective traveled from the Museum of Contemporary Art, Los Angeles, to the Brooklyn Museum of Art in New York, the Museum für Moderne Kunst in Frankfurt, and lastly the Guggenheim Museum Bilbao, Spain. The exhibition earned widespread attention for, among other things, including a fully functioning Louis Vuitton boutique as one of the exhibits. In 2008, Murakami was named one of Time magazine’s “100 Most Influential People”, the only visual artist included. 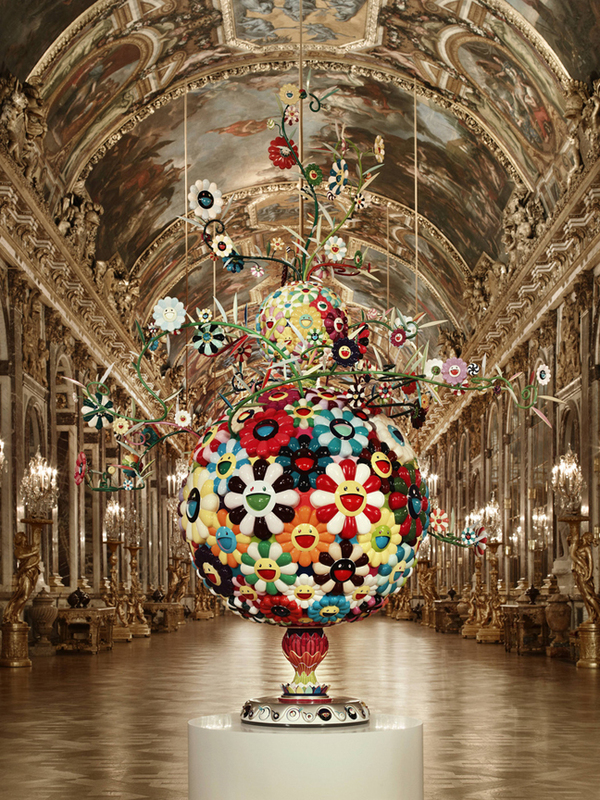 In September, 2010 Murakami became the third contemporary artist, and first Japanese, to exhibit his works at the Palace of Versailles in France, filling 15 rooms and the park with his sculptures and paintings.